Archaeo-astronomical Site Kokino is part of the Tentative list of North Macedonia in order to qualify for inclusion in the World Heritage List. The Archaeo-astronomical Site Kokino is a Bronze age site in the north-east of the Republic of Macedonia, not far from the border with Serbia. It was rediscovered as recently as 2001 by local archeologist Jovica Stankovski. There’s a lot of overenthusiastic misinformation about the site on the web, consisting of often repeated statements such that it is already a WHS or that it gained a 4th place among astronomical sites by NASA research. For now it is on Macedonia’s Tentative List, being put forward as an ancient observatory and holy mountain. Though it may come across as an obscure site, it is fairly well-known within the country's tourist industry. I visited Kokino on the penultimate day of my short Balkan Tour of 2015. There’s no public transport going to the site, so I hired a car with driver from travel-macedonia who did the 3 hour round-trip including an hour's wait for a reasonable 40 EUR. The road to Kokino is fully signposted from the turnoff at the Alexander the Macedonian motorway (the country's other main motorway by the way is named after the 2nd best known Macedonian: Mother Teresa!). The archeological site of Kokino is located at 1013 meters altitude, so when we got closer I searched diligently among the hills in the area in the hope of spotting the site from afar. Without success. After an hour’s drive we suddenly arrived at the "parking" of Kokino. Could this be it? I then noticed a rock protruding above the trees, which I recognized right away from pictures. These peculiar rocks stem from petrified volcanic lava, which has the natural tendency to split and crack. It takes a steep climb of about 20 minutes to get up there, most through the open field. Thanks to one of the previous reviewers I knew I had to take the left path, which looks less inviting than the smooth track to the right that might be going to a nearby farm. From internet research beforehand I learned that there are 4 stone seats (‘thrones’), 2 ritual platforms and 9 markers to 'see'. To my surprise the Macedonians even have placed 5 or so information panels at the top, to mark the various locations. Bronze Age remains were found here, proving that rituals were held. Later the theory was added that the very early Macedonians used this location for astronomy. At the top there are two flat plateaus that seem to be made by human hands. There is a kind of stone bench, with the 4 'thrones' used by dignitaries during rituals. From these seats, but also from two more holy places a little further up, they would have been exactly at the right spot to see important days in the calendar like the Solstice and Equinox. At these days, the sun or moon shines exactly between a specific marker in the rocks on the ridge. I could not make any sense out of it, but it was a fun trip anyway. The odd shaped rocks, views and abundance of wild flowers make up for it. 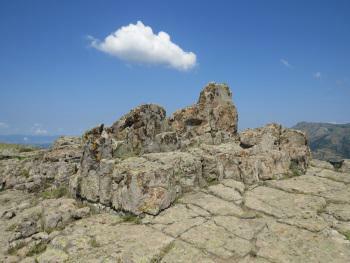 This is Macedonia’s most active TWHS – the country has tried unsuccesfully for Kokino to become a WHS in 2011 and 2012. After an incomplete dossier in 2011, it got a ‘rejection’ advice from ICOMOS a year later which made Macedonia withdraw the nomination before the WHC meeting. ICOMOS indeed is very harsh in its observations about Kokino. They do not deny it was a Bronze age sanctuary (though only one of national or regional significance), but see no scientific evidence that it was used for astronomical purposes. There is no evidence that the 'thrones' or the 'markers' are made by human hands. They are likely products of nature. 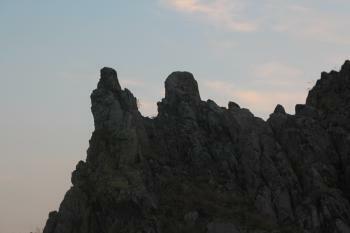 Kokino is also strikingly missing from the UNESCO list on astronomical heritage. So maybe there is a Macedonian Erich von Däniken at work here? If you do not have your own vehicule getting to Kokino can be a big chellenge. You may rent a taxi in Kumanovo - or even in Skopje - if your bargaining skills are good. This will prevent you from getting lost in the Balkans. As Kokino is in the middle of nowhere no public transport goes there. Driving from Skopje you have to follow first the Beograd / Kumanovo signs (E75). Before reaching Kmanovo itself, there will be an intersection where you have to turn right, in the direction of Kriva Palanka (Bulgaria) E71. In some kilometers you will see the sign on the left side Staro Nagorichane. (All singboards are bilingual, so you do not have to read Cyrillic letters.) Here is the first KOKINO signboard too. From there Kokino itself is cca 15 km - definitely not in walking distance from Staro Nagorichane. . You can trust the sings, if you have to turn somewhere, there will be a singboard, but drive carefully and slowly, do nott miss them. At intersections where you do not have to turn, just follow the road there are no signs. Though the road leads you through shabby poor villages, it is quite in a good condition, probably built and financed by some aid agencies, in order to make Kokino a tourist attraction. It is not, there are no kiosks, no food stalls or whatever. At a point the road will be very narrow, barely enough even for one car, but as there is practically no traffic it is ok. Trust the sings from there, not the satellite navigation - the road is rather new, and missing from some softwares. You will see the hill, and the observatory on its peak form a distance. The road sneaks up the hill - and this is the only paved road there, so if you do not leave the paved road you are on the good track. Near the peak you will find a singboard - KOKINO, with some information on its back. If you do not have some detailed description printed out, read it, and try to memorize, up in the peak there will be no isgns, no descriptions. Be careful! There are two paths leading from the parking lot. One looks much better, rather like an unpaved road. The other is much less pretty, and steeper. This is deceipting! You have to choose the worse path, that goes directly uphill. In 15-20 minutes you can reach the rocks. Upto tihs part, it is walkable even for those who are physically not that fit. From there the path diappears, and you have to climb the bare rocks. No stairs, no causeways, nothing, just the rock. Adventurous it is, but definitely not safe for those who are physically chellenged. The landscape is astonishing, and, if you have a good description, a map and even better imagination you will find the "Shamans throne" and other alndmarks. Visited in August 2011. Very difficult to get without your own car. The site is located quite far from civilization. I took the road from Prohor Pcinski (Serbia) to Kumanovo (Macedonia), around 7 km from the border in the village of Dragomance turn left (there should be a sign). The road is not very wide (althoug asphalted) and goes mostly thoughout uninhabited land (hills). From Dragomance it is around 14 km to the observatory (parking place from which it is arond 500 m on foot). Frankly speaking it is not clearly visible, there are no standing structures, just rocks formed by nature or it so distroyed that it looks like natural. Anyway the views are amazing (it is placed on the top of the hill). Also be prepared for strong wind there.